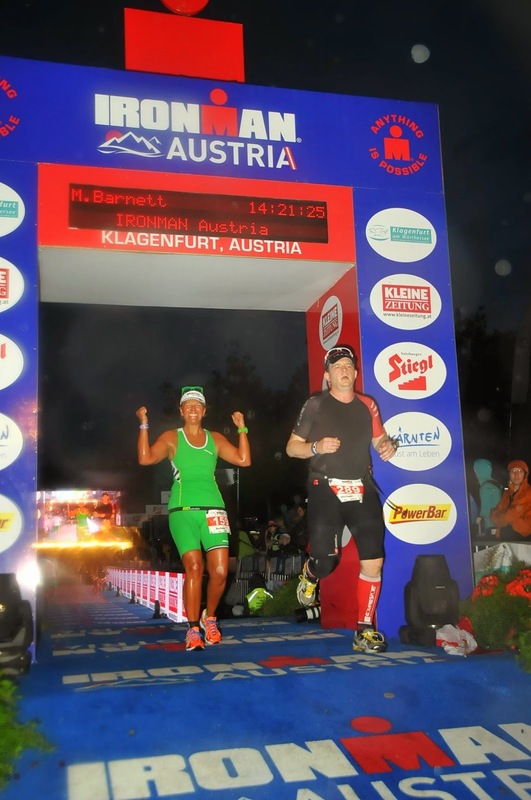 Ironman Austria. What a race. What a difficult day for me both physically and mentally. I haven't mentioned this to anyone else other than those who I knew were racing in Austria because I didn't know how I would feel. Unfortunately 16 days before Austria my Grandma passed away. This shook me to my very core. Since losing my Mum in 2006 I have enjoyed making Grandma proud in what I achieved both at work and more recently in my sporting life. I found the week that followed extremely tough but had to complete the necessary miles if I was to be in any sort of shape come Sunday 29th June. The long run and long bike were extremely tough but in a funny sort of way allowed me to reflect on the good times as they were time alone with only my thoughts for company. They were cathartic in a physically painful kind of way. Anyway I digress. The last time I saw my Grandma in good health. She asked what I would be doing next and so I explained about Germany and Ironman Austria. Having told my Grandma about Austria I couldn't not see it through even though I would be racing with a potentially injured knee. 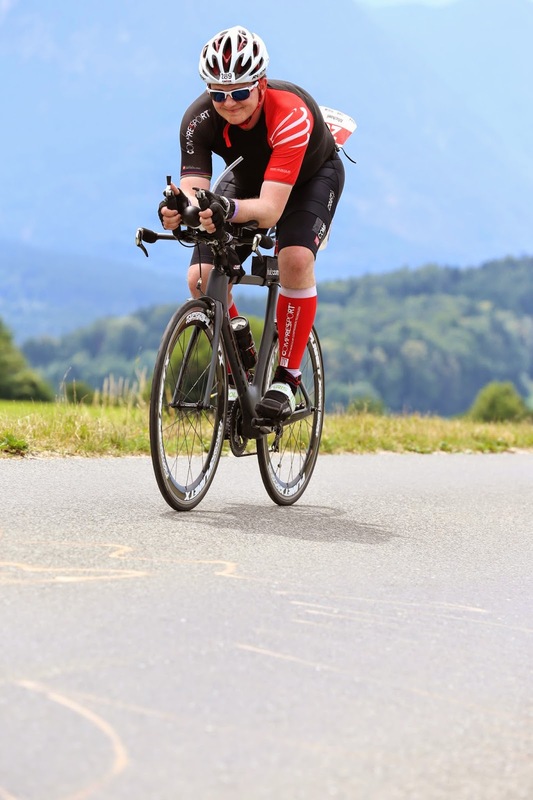 For those that don't know I tweaked my knee 11 days before Austria and so very nearly pulled out but careful injury management enabled me to travel to Austria. The week before the race I did very little. I did lots of walking to strengthen my knee, I swam once in the beautiful Woerthersee (seriously you have to see it to believe it) and I rode my bike for 10 minutes. The race plan was simple. Get to T2 with enough time left so that if needed I could walk the marathon to get to that finish line. I woke up at 03:30 to get my race gear on and travel the half hour to Klagenfurt with my family. I went to transition to pump up my tyres and put my nutrition on the bike. 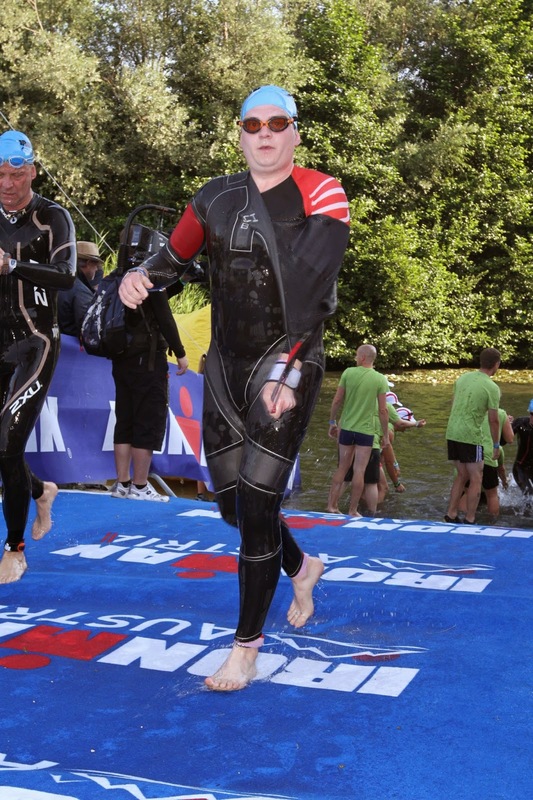 I then made my way to the swim start where I got in the zone and put my wetsuit on. I had signed up for the first wave. This wave was to leave at 06:45, 15 minutes before the main wave at 07:00. There were 799 other competitors in this wave. The race was a beach start. I got to the beach 10 minutes before the start and collected my thoughts. I was stood there with 799 other people and all I wanted to do was cry. I found the wait tortuous. I was filled with a sense of pride, loss and achievement. So many emotions all bubbling to the surface. With my game face on I planned to use the nervous energy to my advantage. As soon as that cannon went it was show time. Paul Kaye counted us down in ten second intervals from one minute. I trotted down to the water and waded for as long as I could before getting ready to swim. As I had hung back a bit from the melee that was bound to ensue I had some overtaking to do. So overtake I did. Whenever I caught someone up I would sight for clear water and put my body in the gap. I caught a few elbows and had a few kicks to the hand but nothing to really bother me. The 1.2km swim out was a thralling mass of moving body parts. If I couldn't find a gap I had to slow down until one appeared. I purposely took the first turn wide to not get caught up in the high jinx that can occur there. As soon as I had turned I aimed for the next buoy. After another 470ish m we turned and headed back for land. As soon as I turned I headed for the next buoy. I noticed that the water became a lot clearer. Either I had been dropped by the pack I was swimming with or someone was swimming off course. I was swimming to the buoys so I couldn't be to far off course, could I? Actually yes I could. Unbeknownst to me the buoys had drifted. At each buoy I sighted for the mass of arms and they were 50m to my right. So I corrected and aimed to rejoin the pack before I saw a buoy and headed for that. After lots of zig zagging between the pack and the buoys we neared the infamous entry to the Lendkanal. I then aimed for the two flags which marked the entrance. Finally something to aim for which could not move. As we neared the entrance I knew there was another 1km to swim. The Lendkanal was shallow and due to the thrashing mass that had already passed the visibility had dropped as the silt on the bottom had been disturbed. The plan was to orientate myself off the canal bank and keep that a set distance from me at all times. There was one swimmer near me who could not swim straight he kept veering from one side of the canal to the other. After a little sprint I managed to pass this swimmer. My watch beeped marking that an hour had passed and I estimated that I was within 400m of completing the swim as I had walked the length of the canal before the race. I turned the last corner and saw the blue carpet. After being helped to shore I looked at the clock. It said 1:05:47. Wow I had PB'd the swim by nearly 5 minutes and I had taken it quite conservatively as I didn't know how hard I could push for the 3.8km. I love the fact that I have my wetsuit half off while someone is checking their watch. I set about the jog to T1 but as soon as I landed on my right foot there was pain in my knee. Oh dear the weeks rest hadn't cured my knee. This was going to be a long day. I plodded to the change tent, put on my cycling shorts and kit and made sure I applied more suncream. It had forecast a hot day and I burn easily. There's no point risking skin cancer for 30 seconds in my eyes. I got to my bike and was pleased to see there were still a lot of bikes left from the first 800. Now just the little matter of 112 miles to contend with. The plan I had formed in my head was simple. I knew there were 3 significant climbs on each lap. Two of these were really severe and the other was short and sharp. I planned to keep my HR above 136 but below 156 on the flat or downhill, below 160 on climbs of no real importance and below 170 on the major climbs. The ride out to Velden (the first 20km) was fast and lovely. After Velden there was a fast descent which marked the start of a 30km loop which included two of the "major" climbs the first being the climb to Faakersee, which was another beautiful lake and the second being the climb up the first descent to complete the loop. I kept my HR in the zones I had decided on. I was feeling okay when I reached Velden for the second time and pushed on knowing that the final 40km had the infamous Rupertiberg climb. I can honestly say I have never witnessed the natural beauty that I was fortunate enough to see during this bike ride. The views were simply stunning. Until you see them with your own eyes you can't really comprehend them. Just wow. I reached the bottom of Rupertiberg and set about the ascent. This climb just kept going and going and going. At one point I reached a flat and thought that was it but rounded a corner to find myself faced with another ascent. Thankfully at the top there was an aid station where I filled up my water bottles before setting off again. What goes up must come down. So down we went. I hurtled down. At the race briefing we were told it was all downhill from the top of Rupertiberg. Oh how they lied. I was glad I did a recce of the course as there were at least another two climbs before I completed the loop of 90km. I completed the first 92k in 3:06:04 which I was pleased with. Now for lap two. There was a bout of heavy rain for the second lap to contend with. I knew what to expect, I knew when to push and when to hold back. I aimed to repeat the same rules with HR but my lack of long rides came back to haunt me. After the second ascent of Rupertiberg, I felt truly awful. My legs were starting to seize up and my quads and hip flexors were burning. I couldn't push hard enough to get my HR above 136. I was on fumes. I then discovered coke at aid stations and after necking several glasses full of the stuff I felt a lot better. I pushed on for the last 25km and was relived to reach transition. My time for the second loop was 3:32:20 and the lack of long rides was apparent with the drop in speed. I reached T2 after 7:53:39 which gave me 9:06:21 to get changed for a run and complete a marathon. I walked through T2 and got changed in the change tent. I applied more suncream and some chamois buttr to my feet. Now it was time to see what this knee was like. I started to run and lasted 100m before there was a shooting pain in my knee. Oh crap. It looks like it was going to be 26.1 mile walk after all. I stopped, reassessed things and decided to soldier on. Like I said earlier I'd told my Grandma I was doing this race, so I was doing the race. I took some painkillers and decided to leave it an hour before attempting to run again. I put on my knee brace and set about walking. So walk I did. I completed over 4 miles in that first hour and tentatively took a few running steps after the hour had passed. After another 30 minutes were I was perhaps at my lowest with thoughts of my Grandma at the forefront of my brain, my wife and Dad appeared like a mirage before me. I hadn't seen them in nearly 3 hours and it was such a relief. I'm sure they could see the despondency in my face. Had my wife told me to drop out then I would have but she told me I had this. I nearly rang my run coach for a bit of encouragement but decided I could walk the last 20 miles in 7 hours and 20 minutes. So off I set again. My aim was to keep my walking pace as close to 4mph as I could. The heat was oppressive and I was so glad I had suncream in my running belt. I picked up sponges at each aid station and made sure I was hydrated. With newly buoyed spirits (but more likely painkillers working) I thought I would have one last go at running. With a sense of relief I could run pain free. Right time to knuckle down and get some miles in. The plan was to run for four minutes and walk for one minute for as long as I was pain free. I ran walked for the next 8 miles. I had no idea of pace but with a dogged determination I kept moving forward. After a total of 14 miles my painkillers were wearing off. I took two more paracetamol and settled in to walk some more. With another six or so miles under my belt, the pain when attempting to run was subsiding so I set off run walking again. It was at this point that I knew I would complete the Ironman. I had about four hours to get through 6 miles. I lessened the run intervals to two minutes as I was starting to tire. It was during this last six miles that I think I perfected the Ironman shuffle. It's not really a run but more of a lope from one foot to the other. I plodded onwards as the sun was starting to set. With less than 1km to go the heavens opened and that last km seemed to go on forever before I made it to the finishing carpet. I jogged down the finishing chute trying to savour the moment. But it was too crowded as someone was proposing to his other half. I didn't get my "Michael you are an Ironman" from the announcer but it didn't matter I knew I had completed the 140.6 miles and earned the right to declare myself an Ironman. Where is the damned finish? I completed in 14:21:25 which was longer than I wanted but it was a finish and that's all that matters. I also PBd at iron distance by nearly an hour and on a much tougher course. There are a few people I would like to thank who helped me get to the finish line on the day. Nick and Dougie. Your banter on Twitter has been immense for the past year and I thank you for the encouragement during the race. Scott B thanks for the high 5s, they helped keep my spirits up. Liz Hufton from Triathlon Plus thank you for the encouragement. Vicky Clarke for run walking with me on the second lap. It truly helped me keep moving forward having someone to talk to. Alan ?? for giving me a "you got this" after the second ascent of Rupertiberg where I was zoned out at the false flat before the aid station. I am also truly humbled by the support I have relieved on Twitter and Facebook. Coming back to so many messages of encouragement has touched me more than you will ever know. Everyone at Doncaster Athletics Club for helping me become a better runner. Dave and Jenny and the team at Blizard Physiotherapy for all the help and encouragement you have given me this year especially Dave who has helped me reassess my 2014 goals twice to get me in shape for two races at completely different distances within 4 weeks of each other. Dean and everyone at Huub for believing in me and featuring me in an advertising campaign. I am still shocked by this. I even got recognised at the race briefing for the advert. The people at TrainerRoad. Even though I got some severe abuse for spending so much time on the turbo over the winter. I know it helped me a lot and helped me increase my power on the bike. 6:38 is hardly record breaking but considering I weigh 15 stone and climbed 1900m its good enough for me. Mark and the staff at TFN for getting #Rinnie ready to race by fitting a compact chain set to her. There is no way I could have done those climbs on a standard. And now most importantly my family for supporting and believing in me. 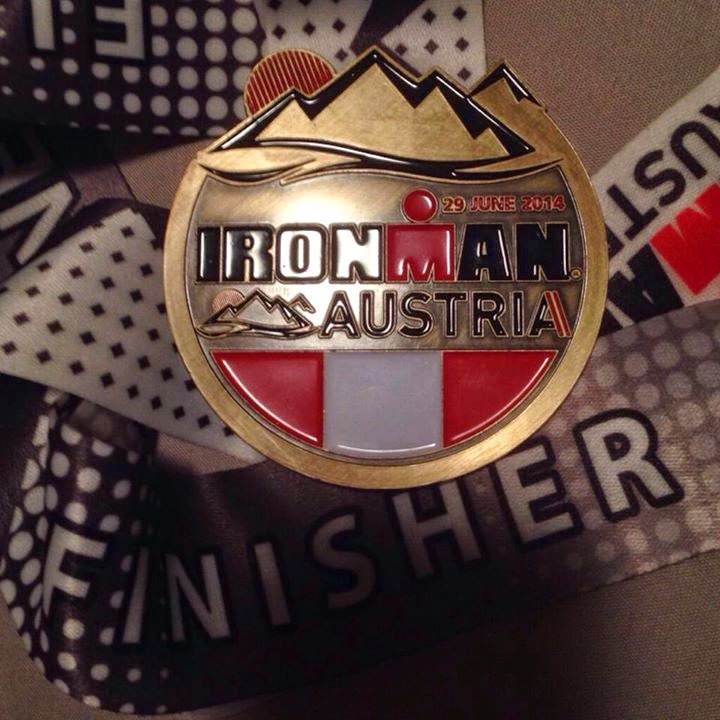 I am an Ironman and bloody proud of the achievement. Is that it for me and iron distance racing. Who knows? I won't be signing up for any in the near future until I have reassessed what I want out of triathlon with Dave at Blizard Physio. During the race I said never again and I know I am more suited to shorter racing but Ironman is like an itch that needs scratching and currently it's under my skin as I haven't had my perfect race yet. I want to run the marathon and suffer through the entire 140.6 miles. I know my preparation for the event was far from ideal. 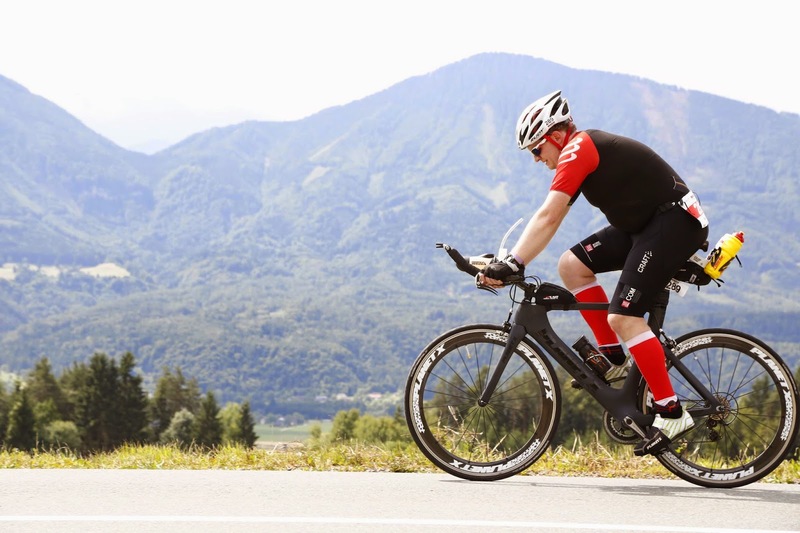 To be able to get to the end of the bike in under 8 hours when I have only twice ridden over 56 miles in the lead up to Austria shows what would really be possible if I truly applied myself to the training required. I also only swim once per week so to be able to post a 65 minute swim when I swim a maximum of one hour each week again shows what could be possible. 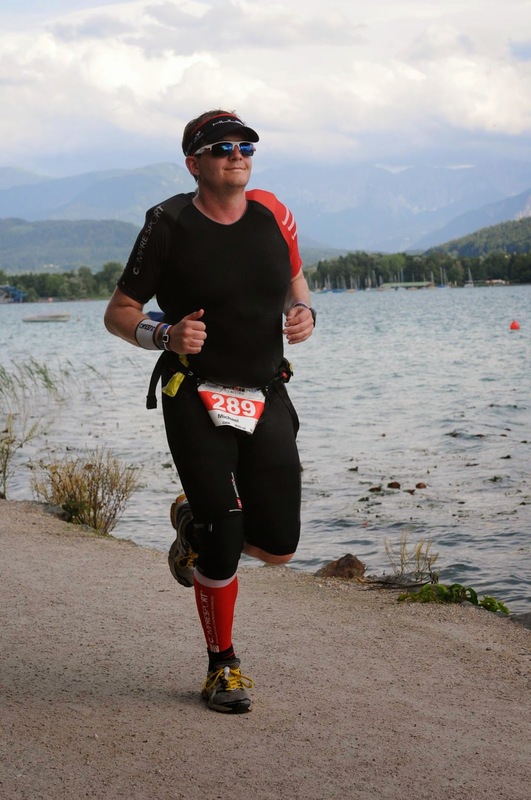 Considering I only ran over 13 miles twice in the run up to Austria, it is no surprise at all that I found the marathon horrific. Even if I had been uninjured, my preparation was bordering on suicidal. Training to go long in four weeks was definitely not my wisest decision. Now I just need to apply myself to my training if I decide to complete another iron distance race in the future. I have withdrawn from Outlaw as I believe that it would have been too much for me to do two iron distance events in the space of 28 days. 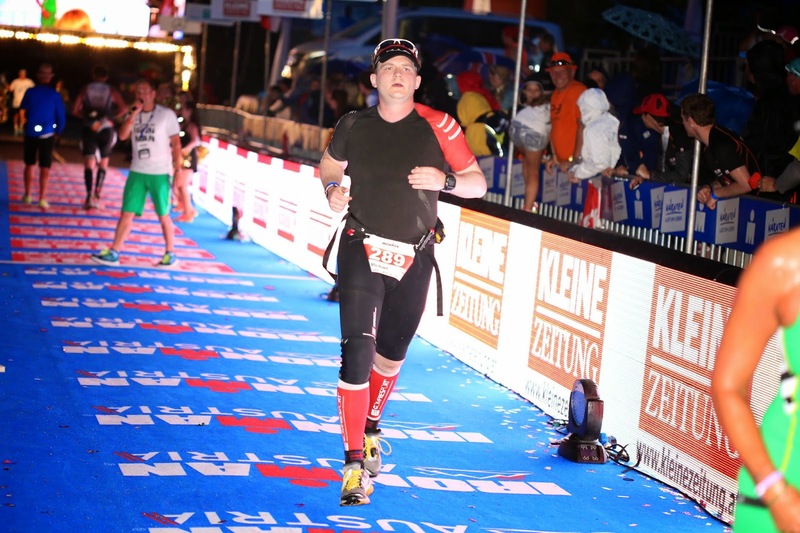 So in summary it is possible to complete an Ironman with far from ideal training as long as you have the mental strength to get to the finish line. It is possible but it is not something I would recommend.